I received a call from my colleague one afternoon inviting me to drop by their office for some hot cross buns. Oooh, free food! So I popped over to their desk and was promptly handed over a warm bun with a white cross on top. A hot cross bun... interesting. And yummy too! Upon returning to my desk, I decided to Google this unique bread. I learned some very interesting facts about it. The hot cross bun is a Good Friday tradition, and is available during Lent. The white cross on it is representative of the Crucifixion. The bun, however, predates Christianity. 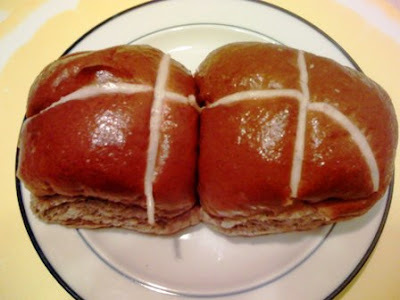 The Saxons once ate buns with a cross on them to honor the goddess Eostre (with the cross representing the four quarters of the moon). The early Christian Church adapted the hot cross buns as part of their early missionary work. In the 16th century, Roman Catholicism was banned from England, and with it the attempt to ban the hot cross buns. But this baked goody was too popular, and so Elizabeth I decreed instead that it can be consumed only on Easter, Christmas, and funerals. The hot cross bun has become a source of English superstition, with some stories alluding powers on the bun itself. For example, a piece given to someone ill is said to help in recovery. If taken on a trip by the sea, the buns protect from shipwreck. If hung in the kitchen, the bun protects from fire and ensures that bread baked there comes out perfectly. Here's one I like: sharing a hot cross bun with another ensures enduring friendship for the year, especially if the following words are uttered: "Half for you and half for me, Between us two shall goodwill be."